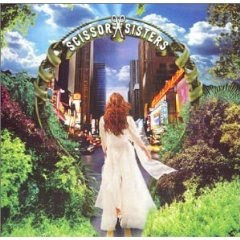 Scissor Sisters infuse pop with a much needed sense of fun... however it does unfortunately end up being more a novelty album than an actually substantial work. Fun dancy music banking on a certain exuberance which makes the music catchy and accessible. This being said the album is a bit too over the place, attempting to fit in as many sexually ambiguous influences as possible in an album form the Bee Gees to Elton John, and the references are often a bit painfully obvious. Take Your Mama and Mary are obvious Elton John "tributes" and Comfortably Numb is one in the recognisable style of the Bee Gees. There was not much more that Scissor Sisters could milk in this particular style and so this album remains as a pretty fun album that gets a bit tiring after repeated listening but which works pretty well in a cluby context. It reached number 1 on the UK and Irish album charts, and was the best-selling album in the UK for the year 2004. Since its release it has gone 7x Platinum in the UK selling over 2,500,000 copies in the UK alone. In Ireland it has been certified a close 5x Platinum. The album was not as successful in their native USA, peaking at #102 on the Billboard 200.